The Multilingual Ibsen is a presentation of the works of Henrik Ibsen in the original Norwegian together with translations into various languages. as images of original materials connected to the texts. 1850: Catilina (Catiline); Nor, Eng. 1850: Kæmpehøjen (The Burial Mound/The Warrior’s Barrow); Nor, Eng. 1856: Gildet på Solhaug (The Feast at Solhaug); Nor, Eng. 1857: Fru Inger til Østråt (Lady Inger of Östråt); Nor, Eng. 1857: Olaf Liljekrans; Nor, Eng. 1858: Hærmændene på Helgeland (The Vikings at Helgeland); Nor, Eng. 1862: Kærlighedens komedie (Love’s Comedy): Nor, Eng. 1864: Kongs-emnerne (The Pretenders): Nor, Ger. 1866: Brand: Nor, Eng, Ger. 1867: Peer Gynt: Nor, Eng, Ger, Hun(2), Rus, Chi. 1869: De unges forbund (The League of Youth): Nor, Eng, Chi. 1871: Digte (Poems); Nor, Ger. 1873: Kejser og galilæer (Emperor and Galilean): Nor, Ger. 1877: Samfundets støtter (Pillars of Society): Nor, Ger, Eng, Chi. 1879: Et dukkehjem (A Doll’s House): Nor, Fin, Eng(2), Fre, Ger, Rus, Dut, Jap, Chi, Ara, Esp. 1881: Gengangere (Ghosts): Nor, Ger, Eng, Dut, Chi, Ara. 1882: En folkefiende (An Enemy of the People): Nor, Eng, Ger, Chi. 1884: Vildanden (The Wild Duck): Nor, Ger, Eng, Chi. 1886: Rosmersholm; Nor, Ger, Eng, Chi. 1888: Fruen fra havet (The Lady from the Sea): Nor, Eng, Hun, Chi. 1890: Hedda Gabler: Nor, Ger, Eng, Chi. 1892: Bygmester Solness (The Master Builder): Nor, Eng, Ger, Chi. 1894: Lille Eyolf (Little Eyolf): Nor, Eng, Hun, Chi. 1896: John Gabriel Borkman: Nor, Eng, Hun, Chi. 1899: Når vi døde vågner (When We Dead Awaken): Nor, Eng, Chi. The Norwegian text material is based on Ibsen’s works as they appear in "Folkeutgaven", published in Copenhagen 1898-1902. Apparent printing errors have been corrected according to the new edition Henrik Ibsens Skrifter (2005-2010, University of Oslo, Aschoug & Co., Oslo). For critical editions and additional material on the Norwegian texts see ibsen.uio.no. For the translations it is the policy of MI to display, when available, the earliest translations made into each language, as these are considered to be of greatest historical interest. The translations are also arranged chronologically, to mirror the diffusion of Ibsen's work globally. The Multilingual Ibsen is a project under development. 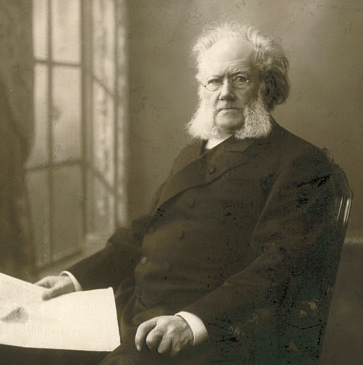 Scholars, students and anyone else interested in the works of Henrik Ibsen are cordially invited to input translations of their favourite plays in their language of interest, and to contribute any other material to the project. If you wish to contribute, or have any comments or corrections, please do not hesitate to contact fredrik.liland@ikos.uio.no. The Multilingual Ibsen is developed under the auspices of Centre for Ibsen Studies at the University of Oslo. The copyrights for all the texts in the Bibliotheca Polyglotta belong to Jens Braarvig and the Norwegian Institute of Palaeography and Historical Philology. Any fair use of the texts is allowed under general Open Access conditions. The Bibliotheca Polyglotta application is Copyright 2007, 2008, 2009, 2010, 2011, 2012, 2013, 2014, 2015, 2016 University of Oslo, Norwegian Institute of Palaeography and Historical Philology, Jens Braarvig, Asgeir Nesøen, and released under the GNU General Public License version 3.